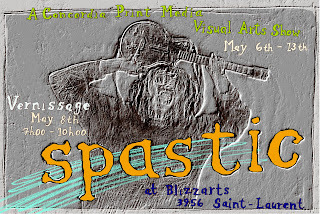 The Student Print Association aka SPA and any interested Print Media student at Concordia are showing prints and non-prints at a small show at Blizzarts (3956 Saint-Laurent) .. Actually let me correct that... I actually think it's going to be a relatively large show, Considering that this years entire print-exchange will be displayed in addition to other works. p.s: Blizzarts is a fun bar/lounge place. Och, ich wuerde so gerne kommen...bitte schick spaeter ein paar Bilder!